The European Project Semester trains students to work together, providing tools and competences to realise ideas in a real-world environment in close cooperation with local industry and organizations. Eu­ro­pean Project Se­mes­ter (EPS) is a pro­gramme of­fered by 16 Eu­ro­pean uni­ver­si­ties in 12 coun­tries through­out Eu­rope to stu­dents who have com­pleted at least two years of study. In a European Project Semester, students work together in an international team on a real-life project that matches their area of study and field of interest. We offer different EPS projects in the second semester (spring semester). EPS is a cooperation between all departments & schools of arts at AP University College Antwerp. EPS is a mix­ture of “Supportive (= project re­lated) Courses” and project organized/​problem based learn­ing. Stu­dents work in in­ter­na­tional and in­ter­dis­ci­pli­nary teams of 4-7 stu­dents on their projects. All teams consist of at least 3 different nationalities and of students with at least 3 different study fields. The language of communication is English. When the student successfully completes the EPS project, he/she is awarded 30 ECTS credits. Students who are selected by their home university or university college to participate in the “regular Erasmus-program” are free to apply for an EPS project, in so far as their study backgrounds comply with the required profiles for the EPS projects they apply for. As EPS projects focus on international teamwork, it is important that students have a solid academic background. Students should therefore have completed at least 4 semesters. Contact the master/bachelor thesis coordinator of your own department to check how you can add EPS to your current program. A lot of youngsters have a hard time keeping their network alive and rebuilding a new network when leaving care. youngsters for the transition from a youth care setting (residential, non-residential or foster care) to adulthood and society. This EPS proposal can be considered a spin-off of the European project. During this project you as a participating student in a motivated team will develop a digital tool or app that supports youngsters in keeping their network alive, reinforcing their network and increasing the involvement of neighbors, friends, relatives but also professionals where necessary to facilitate the transition to adulthood. That way youngsters can feel supported at all times; not only when things don’t go that well in their lives and they need help, but also if they would like someone to share positive experiences and successes of their lives. This means they don’t have to feel alone in taking important steps and making decisions in life. At AP’s hypermodern Campus Spoor Noord next to the green Park Spoor Noord and Antwerp’s trendy region ‘t Eilandje. Chemical and petrochemical companies in the Antwerp harbor have a large need for professionals with knowledge of process automation. Therefore a 3 meter high industrial distillation column – controlled by the Delta-V system (the DCS system of Emerson) – for didactic goals was installed in a chemistry lab @ AP’s hypermodern campus Spoor Noord. Control of the design of electrical diagrams in E-plan. At AP’s hypermodern Campus Spoor Noord in the lab of Process-control. A campus in which different study programmes take place that are relevant for your project, such as Electromechanics. The influx of unaccompanied minor refugees is a challenge for cities as Antwerp, also during the phase in which these youngsters reach the age of adulthood. They suffer psychological traumas, often leave schools unqualified, loose intensive follow-up by social workers etc. The most complex challenge is perhaps housing: prices are high and quality low; furthermore, discrimination on the housing market is a major problem. With the support of the European government, a cohousing project will start in October 2018 in which Antwerp young adults will become buddy for young adult refugees. An EPS student team will create a socio-documentary for multimedia use that zooms in on daily life in this cohousing projects. What is the life story behind these residents? How does co-existence work in the project? Are the inhabitants of the cohousing project succeeding in bonding with residents in the neighborhood? What role do the professional supervisors play in making this project a success? 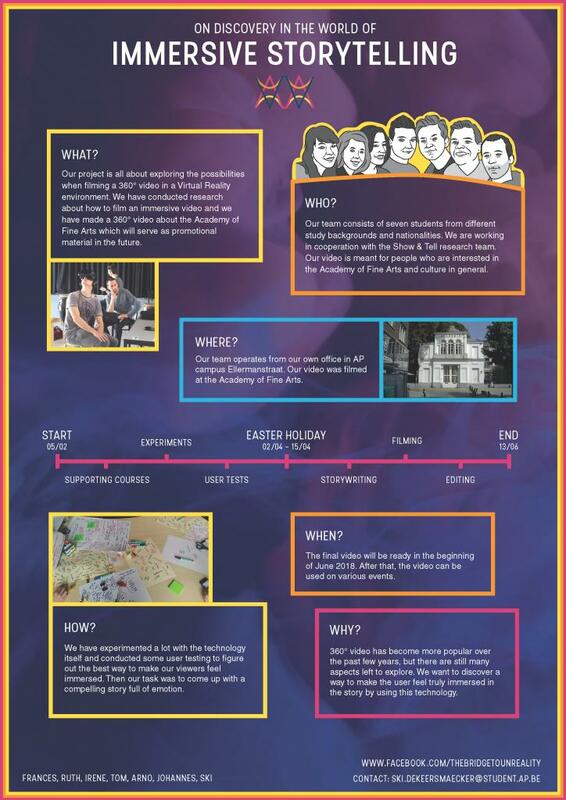 And do the EPS students themselves also have an impact on this project by making this socio-documentary? The result at the end of the semester will undoubtedly provide answers to these and other questions. At AP’s hypermodern Campus Spoor Noord next to the green ‘Park Spoor Noord’ and Antwerp’s trendy region ‘t Eilandje. Few themes speak more to the imagination of children than astronomy. Spacecraft, astronauts, stars and planets, the galaxy and the universe: space themes are ideal for children to learn in a playful way about science and technology (both in the classroom and in the home environment). Kids in Space is an ongoing project that spans multiple years. Curious what the previous project group already achieved? Take a look at their research poster. 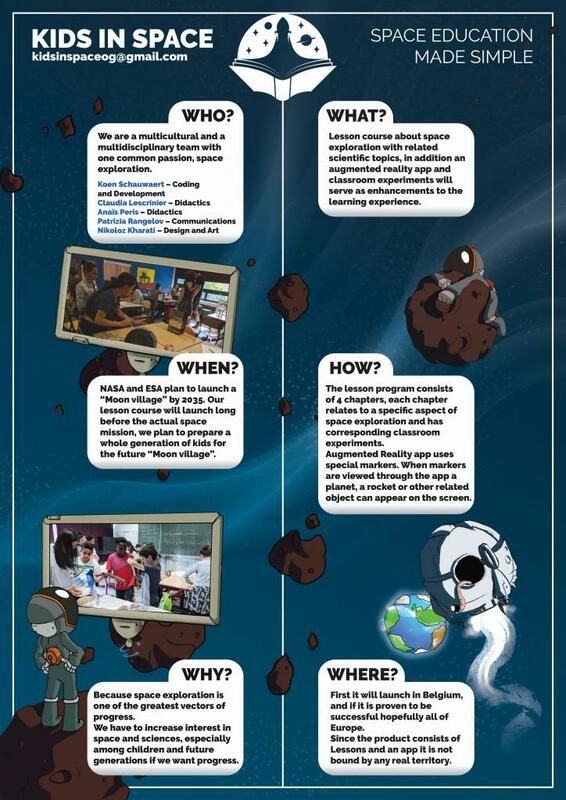 An international and interdisciplinary mixed student group will – both pedagogical, thematically and technically – conceptualize and develop an educational mobile application on STE(A)M topics (Science, Technology, Engineering, Arts and Mathematics), with a focus on space-related topics (spaceflights, human bases on the Moon and Mars, earth observation from space to monitor e.g. climate change, …) that meet the learning objectives of the target audience (children from age 3 to 16 – to further specify in consultation with the client). Using the pedagogical method of gamification EPS students will design an innovative digital tool that stimulates children’s fantasy, captivating them in a fascinating way about science and technology in general and about astronomy in particular. 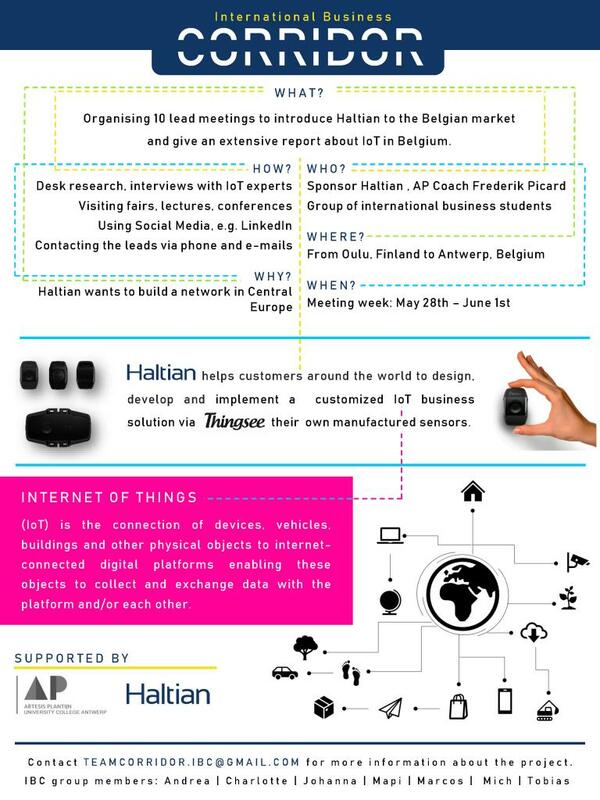 This self-enterprising student group will be coached by experienced lecturers of Artesis Plantijn Hogeschool Antwerpen. A focus group of students of international partners institutions will provide input and feedback and will test the mobile application with multiple audiences (pre-primary, primary and/or secondary education). The working language of this mobile application will be English (thereby also stimulating foreign language development of the target audience). At the department of Education and Training at AP’s hypermodern campus Spoor Noord, in close collaboration with the Observatory of the University of Ghent - Armand Pien. Immersive storytelling is a strong emerging technique that is currently finding its way into new spaces such as theatres, games, documentaries, advertising and journalism. The aim is to give people the feeling of really ‘being there’, calling on 3D gaming, virtual and augmented reality technologies in the process. Opportunities are almost unlimited. For both journalists and artists a whole new world is opening itself in which virtual reality is becoming more and more important and relevant. On Discovery in the World of Immersive Storytelling is an ongoing projecty that spans multiple years. Curious what the previous project group achieved? Take a look at their research poster! How can a story (with a fiction, non-fiction or artistic subject) be injected with graphic, technical and narrative elements to enhance public experience? How can virtual reality and other new technologies increase the quality of journalistic and artistic productions? Students with various study backgrounds go on a journey of exploration in the fascinating world of immersive storytelling. At AP’s hypermodern Campus Spoor Noord (in which different study programmes – such as Applied Informatics, ICT-Electronics and Graphical and Digital Design – that are relevant for your project are being offered). ’Meug’ is an Antwerp based taste agency where both professionals and individuals can find everything that has to do with a qualitative drinking experience. Meug organizes and facilitates tastings, festivals and product launches and offers a forum of good taste through editorial attention. Meug always starts from the story behind a drink. In that way Meug creates a pleasant and surprising experience with drinks. What’s the user experience of the app? Which format for the stories can be made so that producents can easily upload their stories? Which profile details are necessary to make segmentations for paid advertising on the platform? What’s the ideal revenue model of the app? What’s the go to market strategy for the app? Students with various study backgrounds go on a journey of exploration in the fascinating world of stories to taste. At AP’s Campus Spoor Noord (in which different study programs – such as Applied Informatics, ICT-Electronics and Graphical and Digital Design – that are relevant for this project are being offered). Schools are intensely diverse in Antwerp city and therefore have a richness in culture, religion and ethnicity. Inevitably this creates challenges for teachers and social workers that have to cope with this diverse pallet of personalities and backgrounds, but within this variety lies more opportunity and possibility than there are obstacles. Therefore greater affinity with the inhabitants and organizations of Antwerp city is crucial to stimulate chances, collaboration and thriving education. 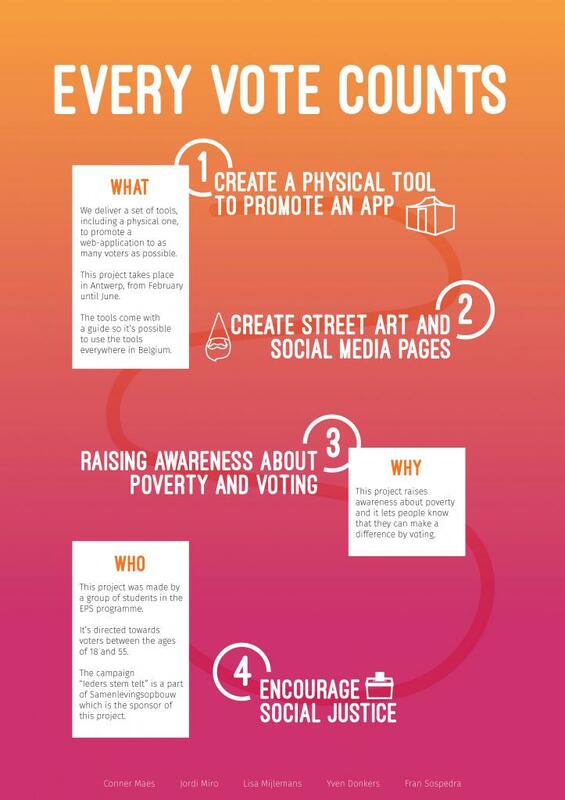 Create a game-app – Based on the ‘Big City Life’-app – through which education training students and social worker students get to know Antwerp and its districts into detail. It could be an efficient way for social work students and teachers-to-be to create more affinity with it’s inhabitants and organizations. Eager to take a quick peek at the process and results of the previous projects? Below you can find the research posters of every project group. Those will certainly provide you an clear and brief insight into each project! The registration deadline for European Project Semester in spring (February till June) is 1st November 2019. AP partner institutions should send the student’s nomination to the AP International Office: incomingstudents@ap.be. We would like to take into account the student’s preference with regard to the projects we will offer in spring 2019. Therefore, we ask them to fill out this small online survey. We will communicate with you by means of your personal email address and your mobile phone number. Artesis Plantijn University College Antwerp awards 30 credits for one semester. Credits are awarded only when the course has been completed and all required examinations have been successfully taken.